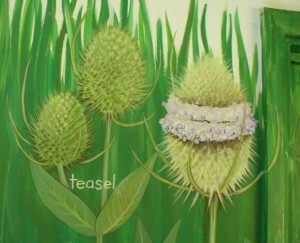 The Teasel is a tall, dramatic wildflower, a biennial that begins life as a rosette of leaves lying flat to the ground. Each leaf is rounded, its surface a pattern of folds and bumps. 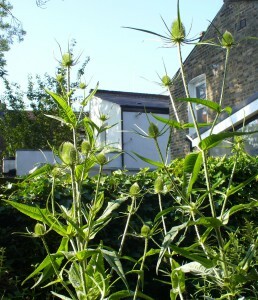 In its first year, it can easily be pulled up and moved to a sunny spot where passing humans will not brush against it. In its second year the Teasel grows like Jack’s beanstalk. 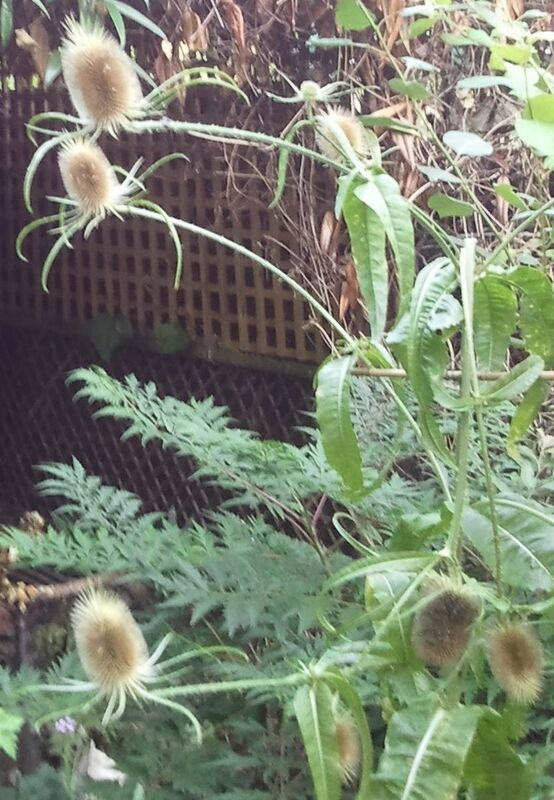 The rounded leaves become daggers, with prickles running from the spiny stem down to the now-pointy leaf tips. 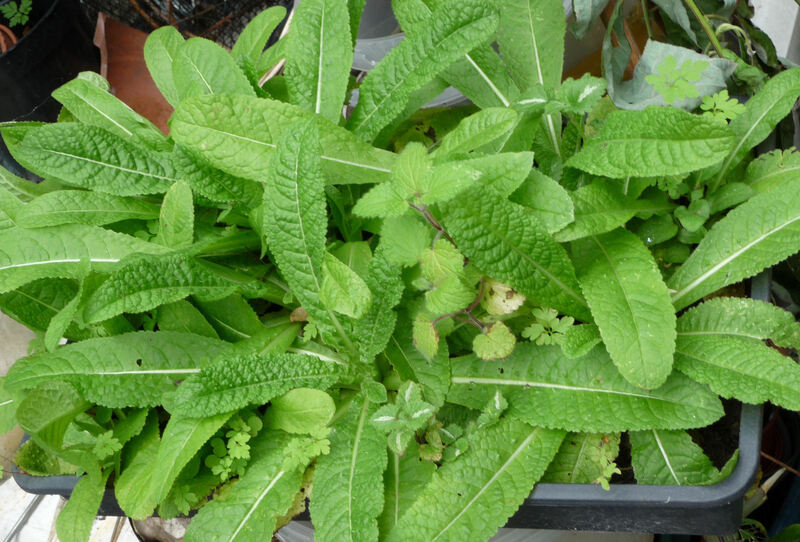 Rainwater collects in the joins where the leaves clasp the stem, a feature of this plant ; its botanical name comes from the Greek ‘dipsa’, for thirst. Now quite protected from grazing animals, the prickly Teasel is free to grow, and can reach a height of 2.5 metres (8.2 feet). 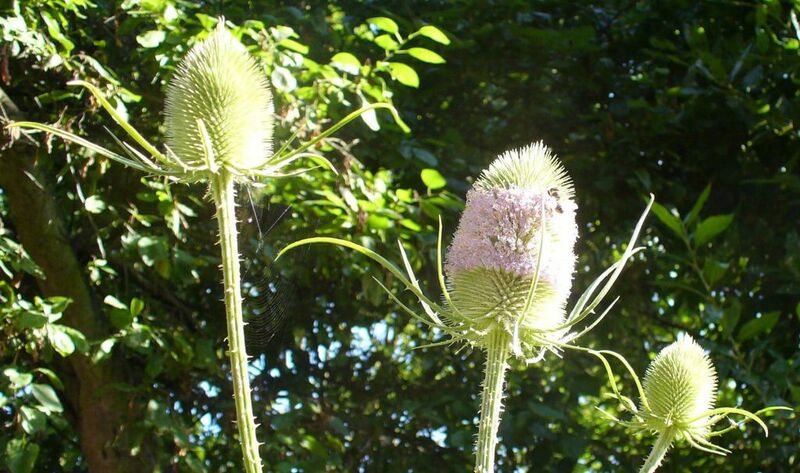 Spiky green, eggshaped ‘thistles’ appear at its stem tips. Tiny LAVENDER PINK flowers appear in bands around these egg-shaped ‘thistles’ attracting bees, and butterflies such as the Red Admiral and the Comma. 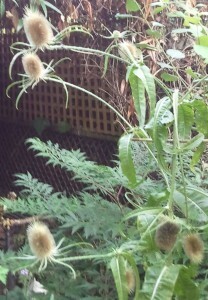 Seeds form later, enjoyed by Goldfinches and other birds. Other names: Barber’s Brushes, Brushes and Combs, Card Thistle, Church Broom, Donkey’s Thistle, Fairie’s Broom, Fairies’ Fire, Fuller’s Teasel, Gypsy-combs, Hair-Brush, Johnny-prick-the-finger, Lady’s Brush and Comb, Lady’s Brushes, Little Brushes, Teazel, Teazle, Venus’ Basin, Venus’ Cup. 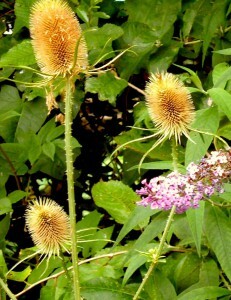 In Christopher Lloyd‘s garden at Great Dixter, Teasels planted in the massive flowerbeds are left – dried, brown and dramatic – after the plants have finished flowering. 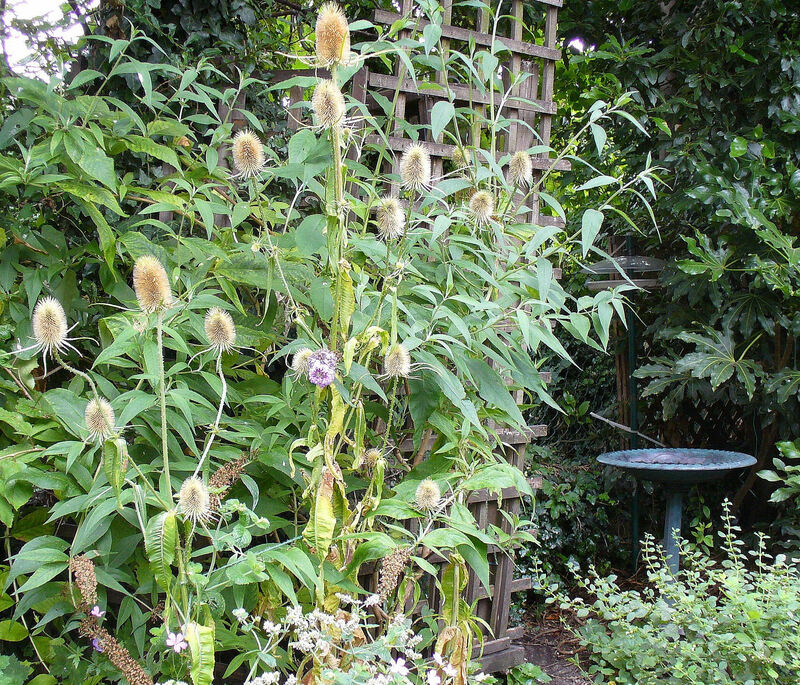 Here, in our somewhat more modest garden, we too leave the dried remains of our Teasels to stand through the coming winter. 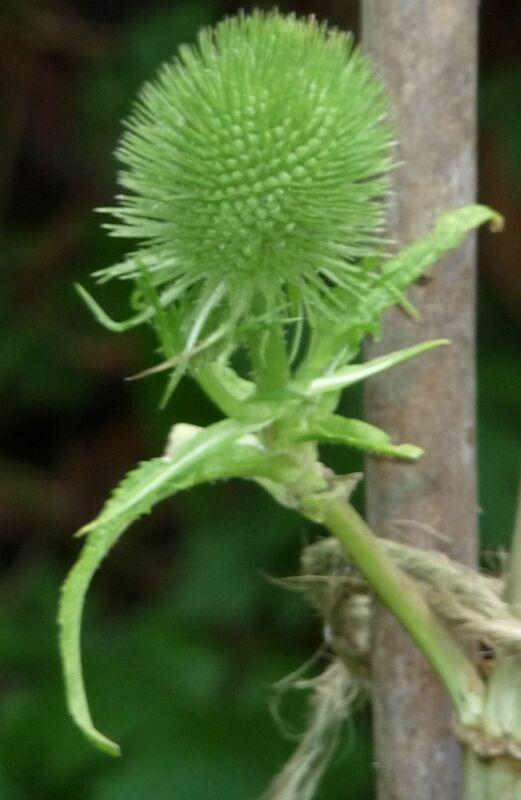 Dipsacus fullonum will grow in most soils, & each prickly head can produce as many as 2,000 seeds. 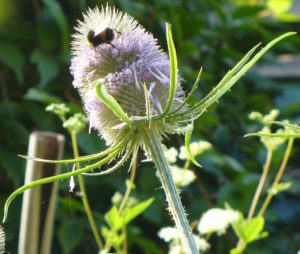 In this garden our wildlife eats most of the plant’s seeds, but a few usually survive to become new Teasels the following spring. In the USA, where it was introduced, Teasel is now an invasive species in some states.